Explore hidden gems such as Lemmenjoki National Park and Lake Inari. Take a break from the city and head to Urho Kekkonen National Park and Reindeer Farm Petri Mattus. 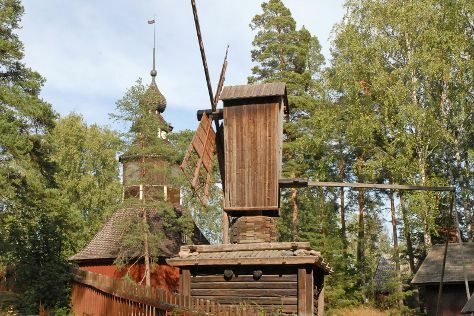 Step out of Saariselka with an excursion to Inari Reindeerfarm in Inari--about 1 hour away. For photos, other places to visit, ratings, and more tourist information, go to the Saariselka online trip maker . Amsterdam, The Netherlands to Saariselka is an approximately 13-hour flight. You can also drive. The time zone difference when traveling from Amsterdam to Saariselka is 1 hour. Prepare for slightly colder weather when traveling from Amsterdam in August: high temperatures in Saariselka hover around 19°C and lows are around 9°C. Wrap up your sightseeing on the 21st (Wed) to allow time to travel to Helsinki. Start off your visit on the 22nd (Thu): admire the striking features of The National Library of Finland, hunt for treasures at Hakaniemi Market, test your team's savvy at popular escape rooms, then explore the world behind art at Kansallisgalleria, and finally get engrossed in the history at Seurasaari Island and Open-Air Museum. For maps, photos, more things to do, and tourist information, refer to the Helsinki trip planner . Getting from Saariselka to Helsinki by combination of bus and flight takes about 4.5 hours. Other options: do a combination of bus and train; or drive. In August, Helsinki is somewhat warmer than Saariselka - with highs of 24°C and lows of 13°C. Finish your sightseeing early on the 22nd (Thu) so you can travel back home.